With weather slowly beginning to play its part, we are finally looking at some good footing on race day and that is exactly what we are after for our three runners on Wednesday. With the track currently rated a Dead5, our hopes for better ground look promising. All Knitted Up (pictured) makes his long awaited return, following a deserved spell over the winter period, and we are pleased to report the son of Mastercraftsman presents in outstanding order ahead of his first up assignment in the Rating 65 event over 1400m. “He’s plenty stronger and more physically developed this preparation, and while we know he needs further, we have been pleased with his progress leading into Wednesday’s race and it’s a good starting point,” co-trainer Pam Gerard said. All Knitted Up was an impressive winner at his home track last preparation and providing he puts his hand up this preparation, he may find himself among at the top end of the staying ranks at the business end of the season. The second runner on the card is Kane (Darci Brahma x Dream Lass) who wasn’t quite able to overcome the wide draw at her first outing at Matamata, after impressively winning a trial a Te Teko previously, but tomorrow’s draw of three and the better surface should play in her favour. “She’s a nice filly that only needs a little bit of luck to give this field a decent shake,” Gerard said. 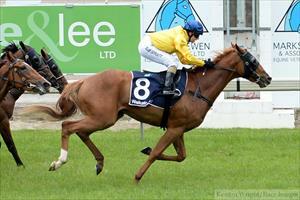 Kane competes in the maiden event over 1400m and senior jockey Craig Grylls has been appointed to ride. The last and final runner for the team is debutant filly Avec Moi (Pour Moi x Fuji Belle) who also lines up in a very competitive maiden fillies and mares field, but again, the prominent barrier draw combined with the better track has been enough for the Moroney/Gerard combination to give her a start. “It is a very strong field, but you have to come up against these class of animals sooner or later and we think she will only improve with further racing and distance,” said Gerard. Avec Moi is a daughter of sensational Derby winner Pour Moi who has returned to New Zealand to commence stud duties at Windsor Park Stud for the 2016 breeding season.